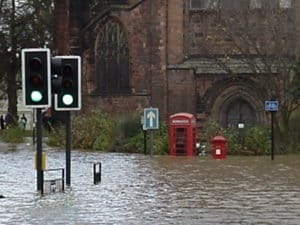 It was recently revealed that the UK government is set to plan for 20-30% more extreme downpours than it ever has done before, after being criticised for its response to flooding across the country over the past few years. With the government expecting more flooding to take place across the UK, what can homeowners do to reduce the risk of damage to their property? While solutions and defences implemented by the government, councils and other, larger organisations have the biggest impact on flood defence, there are certainly things you can do personally to reduce the risk of flooding in your property. Simply put, surface water refers to rainwater that falls anywhere on your property, from your roof to your paths. This is typically removed from a property and into a public sewer by a network of drains and gullies. However, silt and debris, such as leaves or moss, can block these drains and cause water to build up further. Fat is one of the ‘dirty dozen’ items that absolutely should not be poured into the drain. It congeals in the drains and reduces water flow, which causes problems when you need full bore flow on drains and sewers at times of heavy rainfall. The ‘fall’ of a drainage pipe refers to the distance between the highest point of the pipe and the floor. In other words it helps us work out the gradient, or steepness, of the pipe, to ensure water can flow away very quickly. A professional can help you ensure the fall and gradient of your pipes are correct. Getting it wrong could mean water does not flow quickly enough, but could also lead to solids getting stuck in the pipes and causing blockages. The Environment Agency operates a very detailed flood map, which displays the latest flood warnings, as well as the level of flood risk in your area. Friends of the Earth offers another easy-to-use flood map. These resources can help you better plan for floods before they happen. Floodline Warnings Direct is a free service from the Environment Agency that provides flood warnings by phone, text or email. Find out if you are eligible to sign up for the service by calling 0345 988 1188. Do you know the level of cover granted to you by your contents and buildings insurance policies? If not, check your policy and make sure you are covered for flooding and what you are expected to do, from an insurance perspective, in the event of a flood. If flood water is about to enter your home, it’s important to turn off the gas, electricity and water supplies as soon as possible, if it’s safe to do so. Find out in advance how to do this by contacting your provider and make a note of the steps so you can do it quickly when the circumstances arise. You may not ever need it but temporary flood protection equipment such as floodboards and sandbags can help to protect your property. While sandbags are often provided by councils, sometimes they run out, so it may be worth investing in your own, or alternatives to traditional sandbags such as FloodSax. Find out how to use sandbags properly.